Buy a new version of this Connected Casebook and receive ACCESS to the online e-book, practice questions from your favorite study aids, and an outline tool on CasebookConnect, the all in one learning solution for law school students. CasebookConnect offers you what you need most to be successful in your law school classes portability, meaningful feedback, and greater efficiency. From a preeminent authorship team, Criminal Law and its Processes: Cases and Materials, Tenth Edition, continues in the tradition of its best-selling predecessors by providing students not only with a cohesive policy framework through which they can understand and examine the use of criminal laws as a means for social control but also analytic tools to understand and apply important criminal law doctrines. 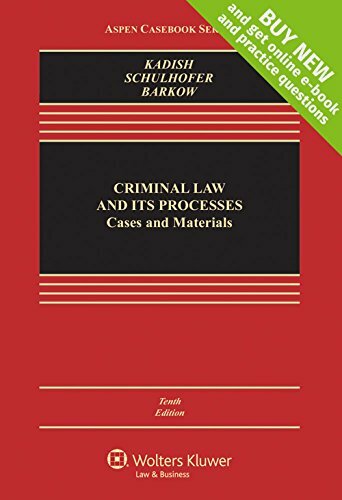 Instead of presenting the elements of various crimes in a disjointed fashion, Criminal Law and its Processes: Cases and Materials focuses on having students develop a nuanced understanding of the underlying principles, rules, and policy rationales that inform all criminal laws. A cases-and-notes pedagogy along with scholarly excerpts, questions, and notes, provides students with a rich foundation for not only the academic examination of criminal laws but also the application of the law to real-world scenarios. Retains prior edition s principal cases and Notes and Questions approach to explain and probe fundamental concepts. Notes updated to incorporate contemporary cases and recent news touching on criminal law. Perry v. Florida (examination of the agreement requirement for conspiracy through the lens of a Florida sexual battery offense). Theft (chapter 9) substantially revised to include new principal case dealing with trespassers takers in the credit card context.